Jim Lee & K°, USA. August 27 - September 1, 2007. Good morning from Saint Petersburg! Well, it is not exactly 74 degrees as it was last week but at 7 am here the sun is coming out and it should be a very nice day in the 60s. Great day for going to see where Catherine hung out in her Pushkin palaces... hmm. There is a story there .. old girl with her young Push. Wonderful day yesterday with a visit to the Peterhof, the summer palace of Peter the Great who actually used it . As you look at the fountains, remember there is no pump anywhere. All of the fountains work on gravity from a lake some 20 KMs away and flow into the sea. What a feat of engineering. The whole place was partially destroyed by those bad Nazis but since t hen as you see, it was restored to its original glory. 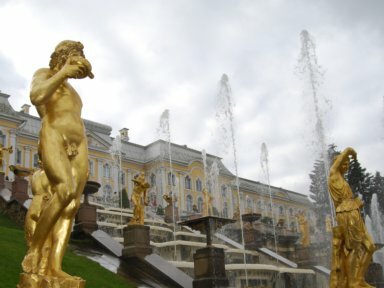 Peter wanted his own Versailles and he did it. The place is huge and there is just room after room of amazing silk and art. But the glory is also in the surrounding grounds and the arrival by canal from the Gulf of Finland. Wow. 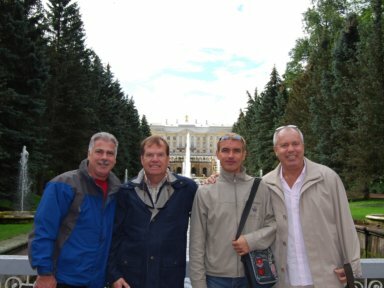 Spent the day at Peterhof and then on to the hotel and out to shop in the huge collection of shops in the nearby block long "mall". Nothing really to buy but very nice to see how the other side is living. Things are good in general according to our guide Nicky (we have renamed him). En route to the Armenian restaurant whose name is the ancient name for the capital of Armenia, Eravan. ok, so who knew that? Anyway, we had Carl to guide us through the choices and it was like we never ate before. Oh my, cool thing is the restaurant has this dinner service plate set that is made by the Imperial Porcelain makers here in St P, so take a look. I tried to steal one but they said no no no.